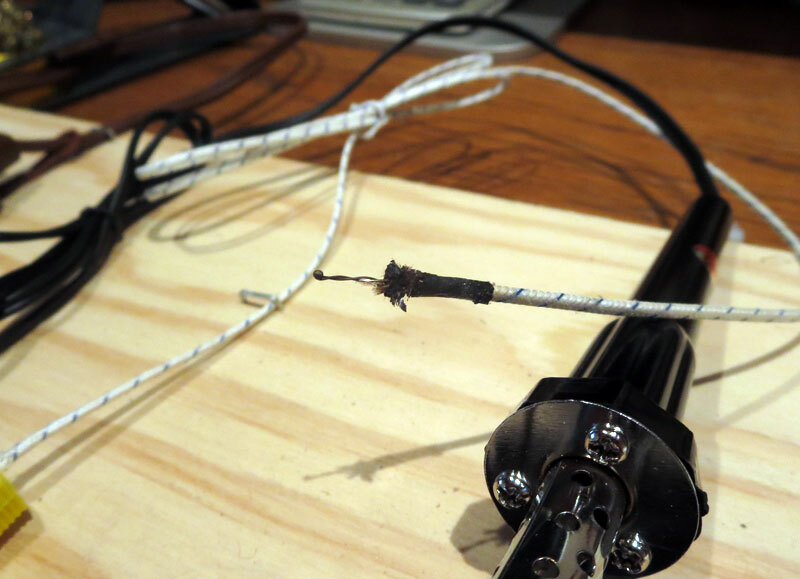 This makeshift method can be used if the thermocouple spot weld breaks off or even if you want to make a new thermocouple from wire. A thermocouple is used when modifying a soldering iron as in this previous post. 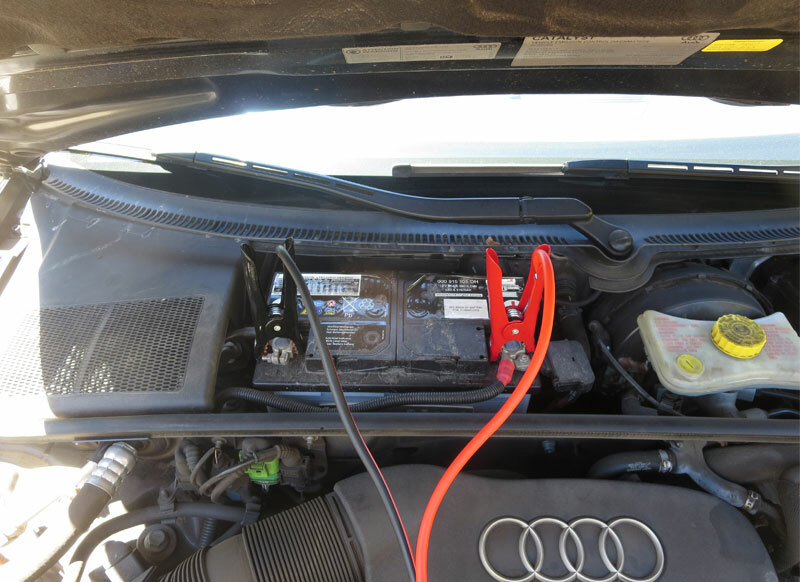 Connect the jumper cables to a 12 volt car battery. Take precautions to connect the cables in the right order and make sure that the clamps at the opposite ends of the cables are not touching. Most car batteries have a negative ground. Normally one would connect the red cable to the positive terminal first, followed by the black cable to the negative terminal or engine block. Caution! Make absolutely sure that the clamps at the opposite ends of the cables are not touching each other! Doing so could cause a spark at the battery the instant the cables are connected to the terminals. This may cause an explosion and fire plus serious injury or death! 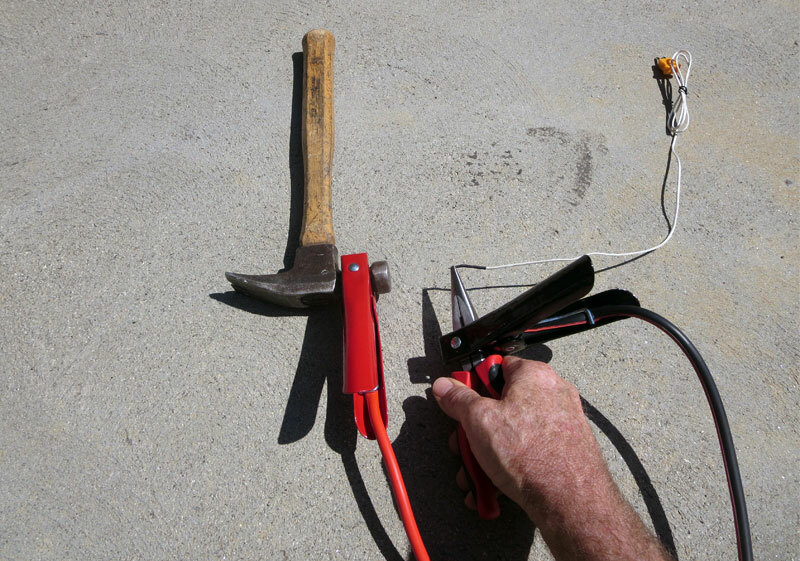 Twist the pair of thermocouple wires together then grasp the bare wires with the long nose pliers like the photo above. Then lightly touch the ends of the twisted wires to the flat part of the hammer head. It should spark and spot weld the wires together. Safety Notice: Make sure to wear safety goggles when spot welding the thermocouple. Note: The plastic handles of the pliers shown in the photo do not shield against electric shock. Keep that in mind. Other pliers with electrical protection may be better suited.